During the last few weeks I've been popping into the greenhouse to make a start on getting my seeds planted. As I've mentioned previously I'd decided which vegetables I'd be growing this year, and as we are at the end of January I thought it was time I shared an update. As you can see from the photo's the Tomatoes and Onions have germinated. I don't have a heated greenhouse so all those seeds that need a little extra warmth sit comfortably on a window sill in the house. I've seen a lot of discussion about people chitting their potatoes, and I had still not bought mine. So today I popped to my local garden centre, they had a good selection, and you can see from the photo which ones I'd selected. I know you are probably thinking there aren't many, but I don't have an awful lot of room to grow potatoes, the early's will be grown in bags and the main in the ground. My favourite way of chitting my potatoes is using old egg boxes. 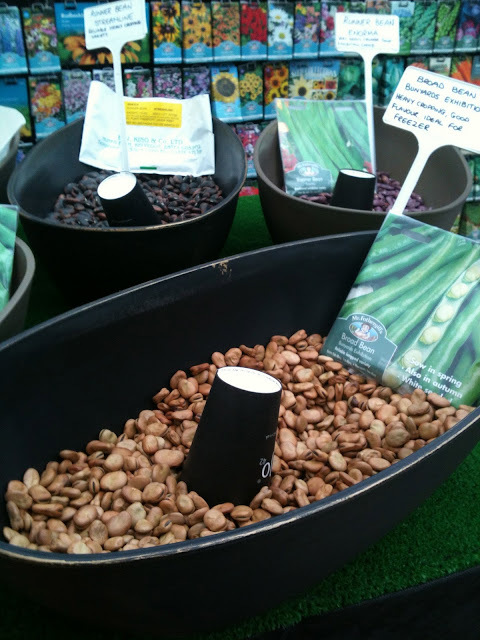 Whilst browsing around the garden centre spotted a lovely display of there peas and beans, which you can buy from them by the cupful! I just found your blog today, I am a new follower :) I just love growing my own veggies as well..but you are ahead of me. I have yet to get anything on the go..but I am itching to get started. I like how your garden center sells beans and pea seeds by the cupful..very handy!